I'm in the midst of a debate with a journalist friend who finds it ridiculous that the mighty Stephens clan would bother sucking up to the most powerful senator in America after the largest newspaper they own went on a years-long jeremiad to get him fired. What a crazy idea, huh? That's a scan of a full-page ad the R-J has been running for a few weeks. If these things were true, then the Frederick-Mitchell tenure at the newspaper would not possibly be viewed as anything other than an unmitigated success. 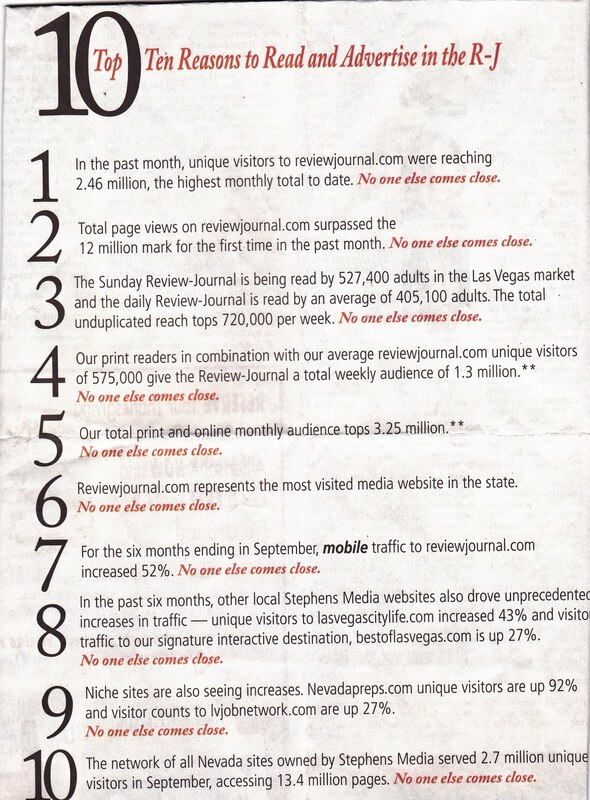 It claims the ReviewJournal.Com enjoys the biggest monthly uniques and pageviews, that the paper is read by 720,000 different people a week, that their total monthly online and print audience is more than 3.25 million people. There's been very robust increased web traffic, according to this, to several different R-J-related web properties. 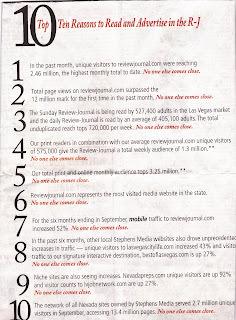 Perhaps the claims in the ad are suspect -- I understand that part of the R-J's readership spike comes from links from the Drudge Report, which means a huge portion of the audience of is of absolutely no interest to local advertisers anyway -- or there are other things going on here.